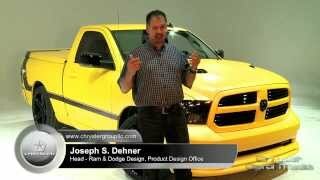 Dodge has revealed the Ram 1500 Rumble Bee concept at the Woodward Dream Cruise in Detroit. 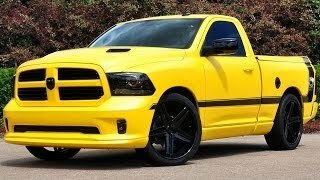 It is based on the Dodge Super Bee muscle cars from the late 1960s and is beased on the 2013 Ram 1500 R/T. 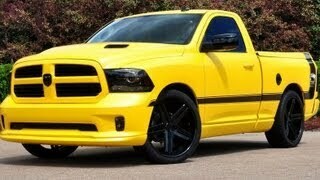 The Ram 1500 Rumble Bee concept has a two-door, 2WD configuration covered in a matte “Drone Yellow” paint. On both sides a new “Speed Bee” Design is swathed within a gloss black stripe that fades into honeycomb. The grille, hood vents, badging, fuel door and the dual exhaust tailpipes are coated in gloss black, carrying the theme on all sides. The interior features a black and Drone Yellow leather sport mesh seats with two-tone yellow/light-grey stitching. “Rumble Bee” lettering and Ram logos adorn chairs, floor mats and door bolsters. Two buttons below the knob control exhaust cutouts and a unique honeycomb pattern is shared with door trim and the dash. 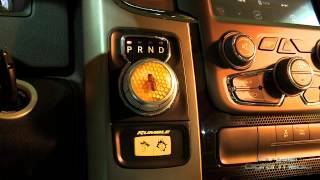 The 2013 Ram 1500 Rumble Bee concept is powered by the 5.7-liter HEMI engine mated to a TorqueFlite 8-speed automatic transmission delivering 395 bhp (294 kW) and a peak torque of 407 lb-ft (551 Nm).